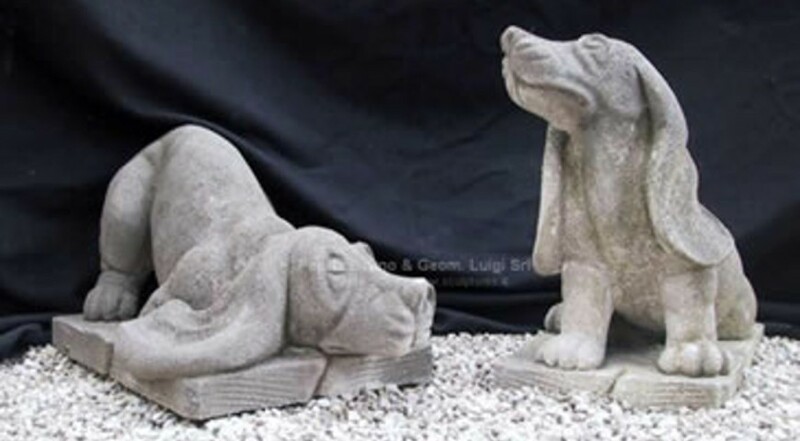 Pair of dogs statues in hand-carved stone for outdoor and garden decoration; carved in different nice positions. Dimensions: Height 18" / 22"
Our animal statues are born to live in gardens, enrich and rekindle them. Each park has its own garden or animal living in it, and our stone statues of animals are created to look at these spaces, at forests and at the natural force that animates them. Stone animals, deers, bears, eagles and squirrels hiding among the trees, or dogs and hand-carved lions standing guard at the entrance. And again, stone dolphins and seahorses that plunge into the fountain ... Our animal handmade sculptures are elegant and finely refined to complete any garden or yard.